» Do You Like Me? The question is: do you like me? A young woman and a man with his hands in the pockets of his jacket stand by the riverside at night, he looking at her and she turning her gaze down to the water. 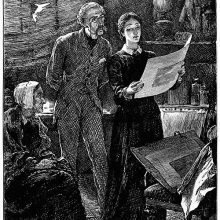 This picture is an illustration for Within the Precincts , by Mrs. Oliphant.